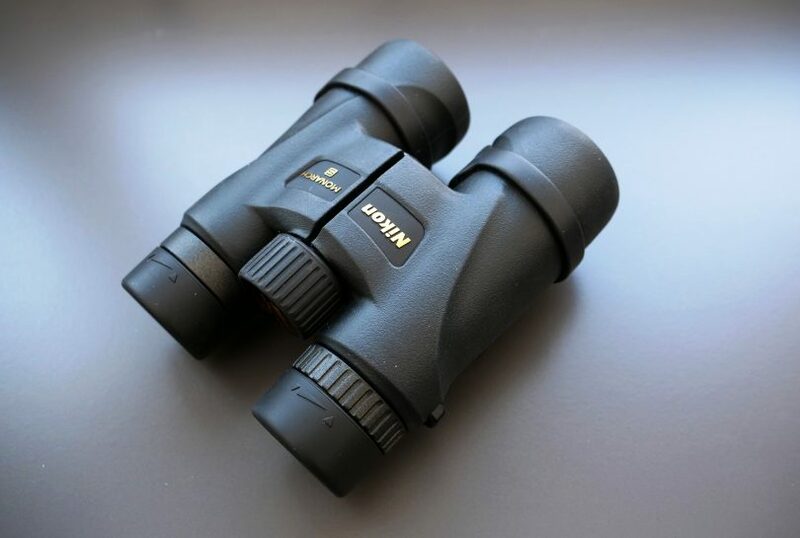 The Nikon Optics company is famous for making high-quality optical instruments and they did the same with these newly badged Nikon Monarch 5 Binoculars that are descendants from the popular Monarch ATB 42mm binoculars. 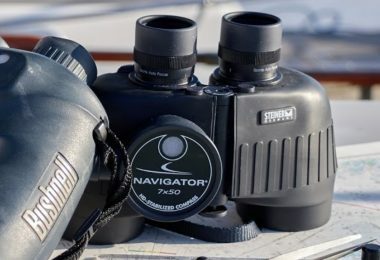 Introduced to the market in 2013, the Monarch 5 features extra-low dispersion or ED glass, which was formerly usually found on the more expensive Monarch 7 binoculars. 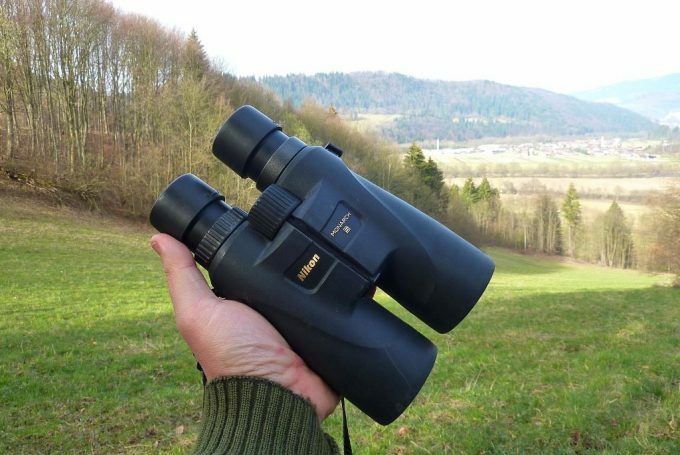 The Monarch 5 is lightweight, sturdy binocular with excellent quality glass, and next, we’ll go into a detailed review about this product. Now that we covered some basics on Monarch 5 binoculars, let’s dig in and see how it performs and how this binocular is made. 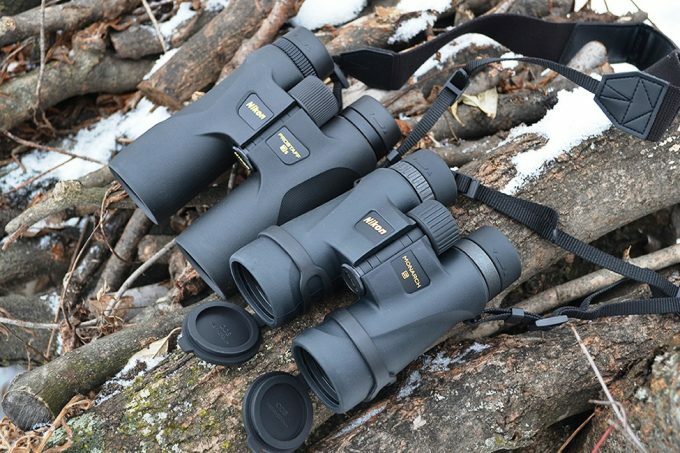 We’re starting with reviews of the product’s features to give you an in-depth look at Nikon Monarch 5 binocular. The design of the body is very ergonomic, and the binocular fits easily in the hands. In order to save on weight, the body of the Nikon Monarch 5 is made from polycarbonate resin reinforced with glass fiber. It weighs 21.6 ounces, making it comfortable to carry on your neck and easy to hold even for extended time periods without significant fatigue. 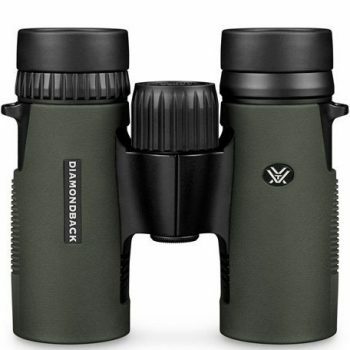 The polycarbonate body is coated with the rubber-like material, and the overall design is very sleek in order to provide for a binocular that is non-slip, easy to grip. Its compact dimensions of 5.7 x 5.1 inches make it easy to carry with you on all your outside adventures. The Nikon Monarch 5 binocular is waterproof and the O-ring water seals can even withstand total submersion in up to 3 feet of water. This feature is especially handy to have if your outdoor explorations take place in rainy weather, near water bodies or in marshlands. This also means that you can clean the binocular by rinsing it in the sink. The internal atmosphere is filled with nitrogen gas to prevent internal fogging of the glass surfaces and it also prevents fungal growth, which may damage the glass coatings rendering your binocular useless. 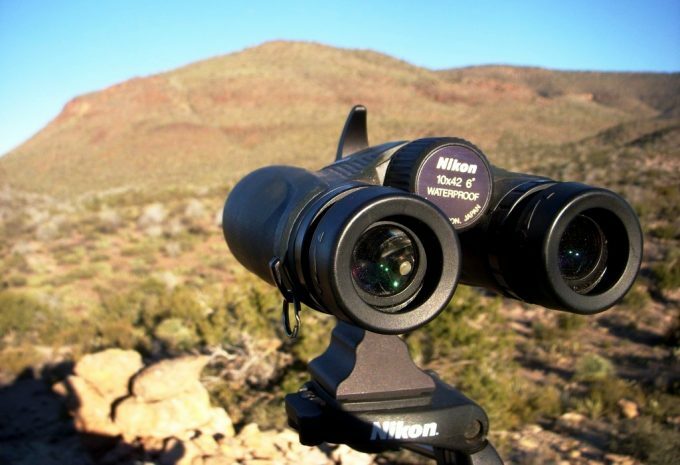 The Nikon Monarch 5 10×42 binocular has a magnification power of 10x, and an objective lens diameter of 42 mm. This gives it an exit pupil size of 4.2 mm, which is a good size to use in almost all light conditions. The prisms have a roof design that allows for narrow binocular. The prisms have a phase correction and dielectric high-reflective multilayer prism coating that provides almost the same brightness as seen with the naked eye, providing high-contrasting, clear images with accurate color reproduction. The lenses are made from extra-low dispersion fully multicoated Eco-Glass. They enable high light transmittance across the entire visible spectrum, minimizing light scattering and reflection and providing clear, natural view. The ED glass reduces chromatic aberration, which in turn gives an image with higher resolution and contrast. The body is designed with a central hinge on which a large, smooth central focus knob sits. The focus goes from close distance to infinity in 1.5 revolutions of the focus wheel. This is a relatively slow focus mechanism, and it allows for more precise focusing on the finer detail. This can be a bit tiring after a whole day of turning the focus wheel, but comes in handy when it is used from a standstill position and looking at fixed distance objects and need some finer detail. The hinge allows for the binocular to be set at many interpupillary distances ranging from 57 to 72 mm. The eyecups have a turn-and-slide motion that can be fixed in several positions, with rounded edges for a more comfortable fit. The eye relief is 18.4 mm, accommodating every user, even eyeglass wearers. There is a diopter adjustment ring that is located below the right eyecup, allowing the user to adjust to its own eyesight. This is not a lockable feature, but it has a stiff movement that keeps it safely in place. Closest focus distance of the Nikon Monarch 5 10×42 binocular is noted at 7.8 feet, which is a good distance to observe close objects in high detail. The field of view is 288 feet at 1000 yards, having a more narrow apparent angular field of view compared to other binoculars of this size. There are several things in the box beside the Nikon Monarch 5 10×42 binocular as well as carrying case that is made from nylon with light, soft padding to protect the binocular. The case has vinyl trim that is sewn to the back to form a loop that can be threaded through a belt or a backpack strap, allowing for easy carrying of the case. Also included is a nice, wide nylon neck lanyard with the Nikon logo on it. 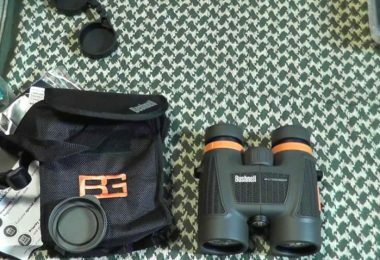 The binocular comes with a rainguard and objective lens covers, instruction booklet, and the warranty card. The objective lens covers are made from a rubberized plastic material that stays on the barrels by friction fit. 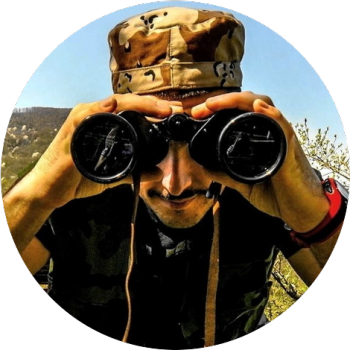 The rainguard is also made from a rubberized plastic material and does not have attachment clips to hold it to the binocular or lanyard, and it can slip from the eyecups. 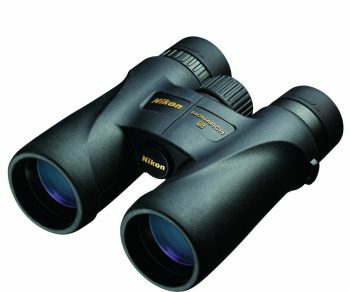 The Nikon Monarch 5 10×42 binocular is an excellent choice for the price range of about $330. For this price, you get a very good instrument with excellent optical elements inside. The only issue with this item is that it is made in China. The dedication of Nikon to its customer’s satisfaction can be seen in the Nikon’s No-Fault Repair/Replacement Policy. This binocular is covered by the Nikon’s 25 Years Limited Warranty, guaranteeing the product will adhere to prescribed standards and if not, Nikon will repair and/or replace it. However, this guarantee does not cover intentional damage or replacement of stolen products. There are many similar products of this kind on the market today. 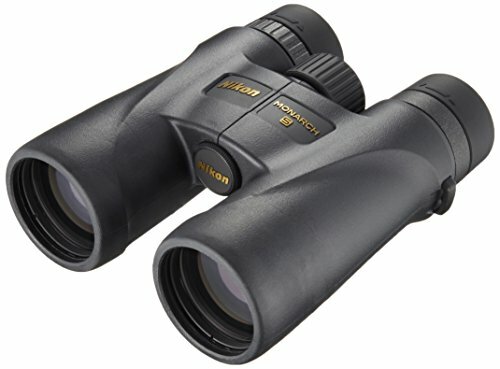 Here are the features that make the Nikon Monarch 5 10×42 binocular unique in its performance. Lightweight polycarbonate resin body: The glass fiber reinforced polycarbonate body offers strong, sturdy and durable chassis protecting the precious optical elements inside. Portable, ergonomic, compact body easy to carry with you everywhere you go. ED Glass lenses: The extra-low dispersion glass lenses with reduced chromatic aberration offer great views of your favorite objects. Having superior contrast and high resolution, the Nikon Monarch 5 binocular will open new horizons of enjoyment. Waterproof and fog proof: O-ring seals that protect it in total submersion, nitrogen internal atmosphere, durable rubber armor coated body to withstand use in harsh weather conditions. Now that we have gone over our main product, let’s take a look at a few other options that are similar to give you an idea of what else is on the market. The Vortex Optics Diamondback 10×42 Binocular is also a good choice for a binocular in the same mid-price range. It has the same magnification power and an objective lens diameter as the Nikon Monarch 5 10×42 binocular which is 10x magnification power and 42 mm objective lens diameter. The Vortex Diamondback 10×42 binocular has roof prism design, with multilayer prism coatings that enable clear, bright images with excellent color rendition. Same as the Nikon Monarch 5, this binocular also has the phase correction coating on the prisms for increasing the resolution and contrast. The Vortex Diamondback binocular is fully waterproof and fogproof with an internal atmosphere filled with argon gas instead of the nitrogen filling on the Nikon Monarch 5 binocular. The body of the binocular is coated with rubber armor for secure, non-slip grip and external protection. The eyecups are adjustable and they twist up and down for use with or without glasses, same as the Nikon Monarch 5 binocular. The focus is achieved through a central focus wheel and it has a diopter adjustment on the right eyepiece. Unlike the Nikon Monarch 5 binocular, this one is tripod adjustable. 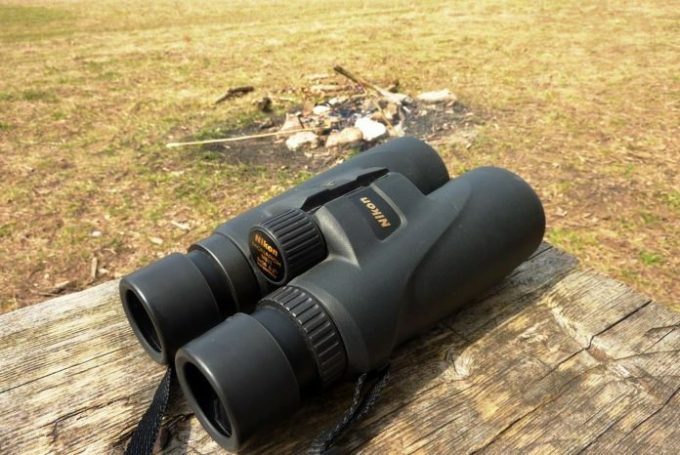 The Vortex Diamondback binocular has the slightly shorter close focus distance of 5 feet compared to the Nikon Monarch 5 binocular whose short focus distance is measured at 7.8 feet. It also comes with a carrying case and neck strap. This binocular is covered by the Vortex VIP warranty and, unlike the Nikon Monarch 5 binocular, this one is made in the USA. Another one of the Nikon Monarch 5 series, the Nikon Monarch 5 7577 Binocular is a good choice for every outdoor enthusiast. Basically, the same features as the Nikon Monarch 5 ED, are found on this binocular, such as 10x magnification power, 42 mm objective lens diameter and 4.2 mm exit pupil diameter. Like all other Monarch 5 models, this one is also built with the extra-low dispersion ED glass for sharper, more enhanced images. This one is a little lighter than its counterpart, making it easier to carry with you on your explorations. It also has the turn-and-slide rubber eyecups, flip-down protective rubber lens caps, and the smooth central focus knob. It sports waterproof abilities with O-ring seals and filled with nitrogen for fogproof performance. The body is coated in rubber armor for durability and comfortable and secure grip. It comes with a neck lanyard, carry case, lens caps, and rain guard. This product is also protected by the Nikon’s 25 Years Limited Warranty. 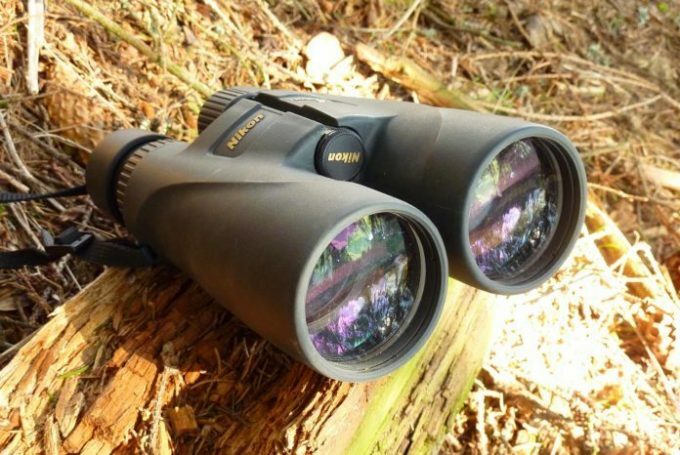 The Nikon Monarch ATB 10×42 Binocular is another good choice from the Nikon family. Within the same price range as all the above, this one also has the same magnification power and objective lens diameter of 10×42 mm. The Monarch ATB stands for All Terrain Body, and this is reflected in its design. The rugged external armor offers protection and durability of the finest optics inside. The ATB is fully waterproof with O-ring seals and is fogproof with nitrogen filling. 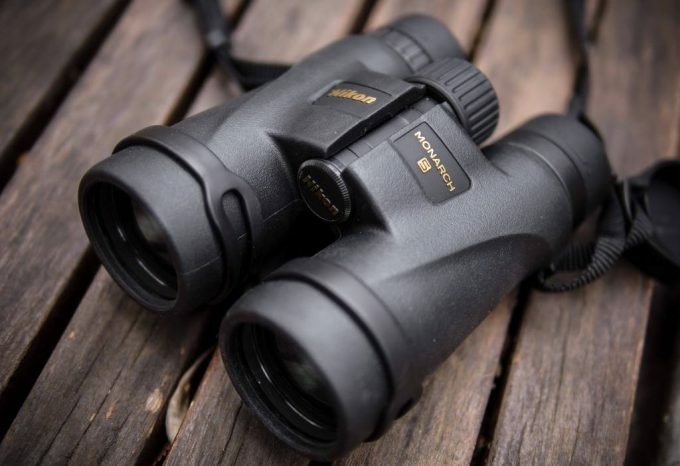 Same as the other Monarch series binoculars, this one also features the extra-low dispersion ED glass lenses, has dielectric highly reflective multi-layer coatings and phase correction coatings on the prisms and fully multicoated lenses. This means that the Monarch ATB offers a great view with enhanced image clarity, brightness, and sharpness. The eyecups on the ATB are multi-setting, click-stop, and it also has the diopter adjustment wheel on the right eyecup. It is the same exact dimensions as the other Monarch 5 binoculars, and it comes with a carry case and a neck strap, but the lens covers on these are attachable to the neck strap and are not prone to losing. This binocular is also covered by the Nikon’s No-Fault Policy and Nikon’s 25 Years Limited Warranty. 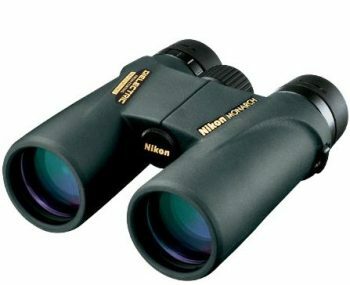 The Nikon Monarch 5 10×42 binocular is a good choice for exploring the world around you in finer detail. Featuring a good 10x magnification power, it also has a large 42 mm objective lens diameter, which makes it very useful even in low-light conditions like early dawn or dusk or even in low light woodland areas. It is made from glass fiber reinforced polycarbonate resin body, which is durable and strong yet sufficiently lightweight and well balanced for easy carrying with you. 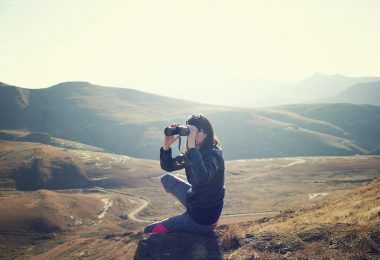 The body is coated in rubber armor that provides external protection and enables secure non-slip grip of the binocular. The optical elements are a pride feature for Nikon. The Monarch 5 features ED Eco-Glass lenses with fully multi-layer coatings. The prisms have roof design and have dielectric high-reflective, multi-layer coating and are phase corrected. The coatings reduce glare and increase light transmittance allowing for beautiful, sharp, clear and bright images. This Nikon Monarch 5 binocular has an eye relief of 18.4 mm, an exit pupil diameter of 4.2 mm, and closest focus distance is 7.8 feet. It comes with a carry case, neck strap, rain guard, and flip-up protective lens caps. The Nikon Monarch 5 binocular is protected by the Nikon’s 25 Years Limited Warranty and also by the Nikon’s No-Fault Policy. Although this guarantees no fault of manufacturing and materials, still it does not cover intentional damage and theft. 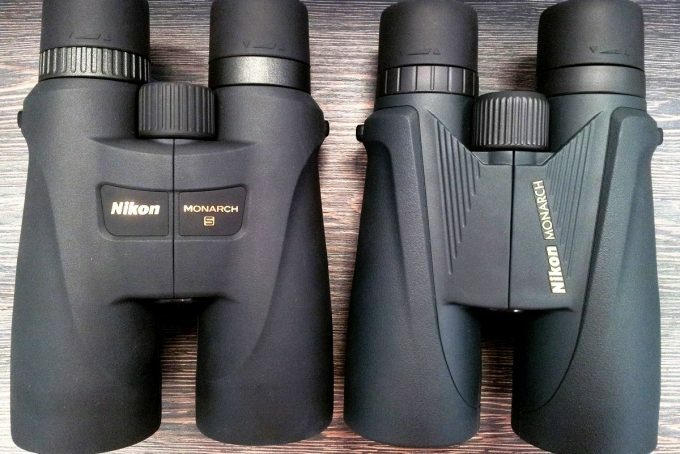 Above we did an in-depth review of the Nikon Monarch 5 10×42 binocular and its main competitors. We have reached the conclusion that this product is an excellent choice in the mid-price range of about $300. The superior quality glass lenses and prisms allow for a perfect view of your favorite landscape, and the close focus distance enables you to come up close to your favorite small object. The waterproof and fogproof performance, ergonomic design and rugged, but lightweight body only enhances the temptation to get yourself one of these. The Nikon’s No-Fault Policy and Nikon’s Limited Warranty improve the deal on the Nikon Monarch 5 binocular. The Nikon Monarch 5 10×42 binocular is a compact, lightweight, durable binocular and overall, an excellent choice for bird watchers, hiking enthusiasts, hunters or all around nature lovers. The quality ED glass fully multi-coated lenses and dielectrically coated roof prisms give enhanced, bright, clear images, all covered by the Nikon’s No-Fault Policy and 25 Years Limited Warranty. Finally, we’d love to hear from you. 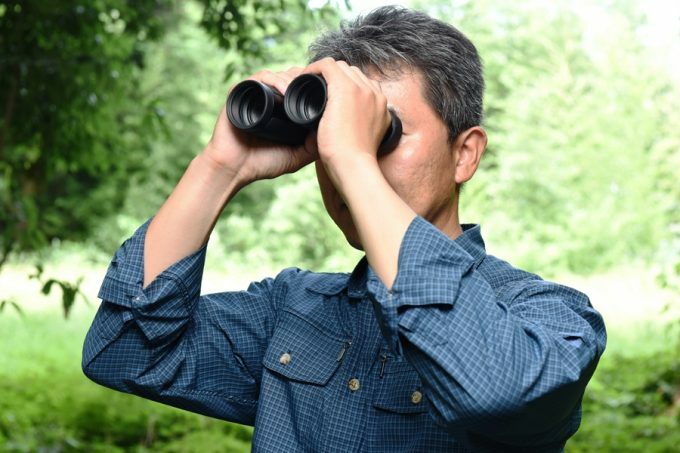 Do you have experience with our binocular picks? If so, let us know in the comments section below.